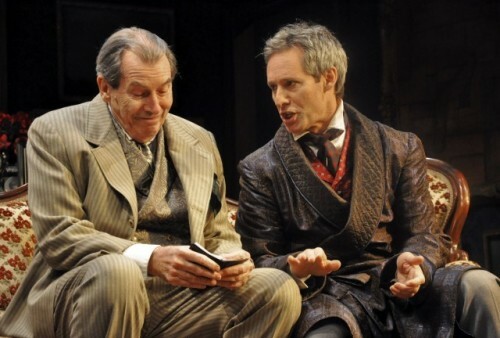 The Actor (Michael Gill) shares his scheme with Dr. Bernhard (Richard Easton). Photos courtesy of Berkshire Theatre Festival. 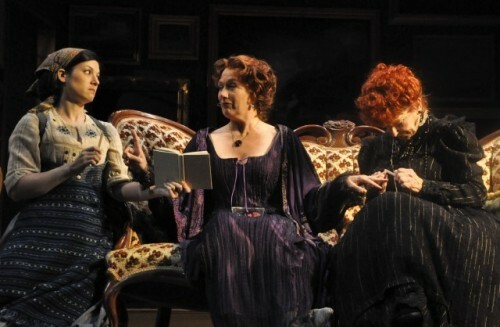 The Maid, Tara Franklin, and Mama, Mary Louise Wilson, help the Actress, Jayne Atkinson, primp for a meeting with her suitor. She is seduced by her husband disguised as The Guardsman. Embracing in a set designed by Alexander Dodge. Scenic Design, Alexander Dodge; Costume Designer, David Murin; Lighting Designer, Mary Louise Geiger; Resident Composer/ Sound Designer, Scott Killian; Production Stage Manager, Stephen Horton. Cast: Jayne Atkinson (The Actress, his wife), Stephen DeRosa (A creditor/ usher), Richard Easton (The Critic, Dr. Bernhard), Tara Franklin (Liesel, the maid), Michael Gill (The Actor/ The Guardsman), Mary Louise Wilson (Mama). There are many reasons to attend theatre. One of them is escape from the cares and tensions of daily life. This is particularly true during summer vacations. The norm of the traditional straw hat circuit, now largely gone, was to offer economical versions of familiar, light hearted musicals and comedies. To the enormous credit of the ambitious Berkshire Theatre Festival they staged the tough and gritty Endgame by Samuel Beckett. In the smaller Unicorn Theatre the demanding play has attracted a steady and enthusiastic audience. Compared to that it is not surprising the BTF has balanced its program by following with the current bit of hilarious fluff, an old chestnut dusted off with a zesty production, The Guardsman, by Ferenc Molnar. The earth shattering gales of laughter should be measured on the Richter Scale. It is a miracle that the theatre was still standing after such a raucous evening of seismic, comedic mayhem. No serious stuff or heavy lifting here folks. Just fun, fun, fun till daddy takes the T-Bird away. If you are looking for an evening of pure escape then Surf’s Up in Stockbridge. The husband and wife team of The Actor (Michel Gill) and The Actress, His Wife (Jayne Atkinson) played their roles totally over the top. Which is likely to happen whenever there is a play about actors portraying actors. In this case a triple whammy as Gill plays an actor who, in a farcical sequence, portrays a character (The Guardsman, a Russian Prince). He is attempting to seduce his bride of six months who has had many lovers. And may be inclined to wander. The Actor hopes to test this theory. The plot hinges on whether or not she is caught up in the deception. Or, more precisely, just when she catches the drift that the charming Prince, played with a simply atrocious accent in the broadest manner, is just her husband hamming it up. As wives will tend to do, particularly Actresses, when he probes her near infidelity it all comes back at him. As Aristotle defined it reversal is one the major devices of drama. There are wonderful supporting roles. Richard Easton, a veteran of the stage, nicely advanced the plot as the elderly Critic, Dr. Berhnard. The Actor has taken him into his confidence. It seems he was among the many suitors for The Actress. One comic exchange entails them trying to list her many lovers prior to the current marriage. Easton is truly masterful as an intermediary between the spouses. The elderly housekeeper Mary Louise Wilson brought the house down. Is she just a maid or the Mama of The Actress. It is never really clear. She is invited in the second of three acts to accompany and chaperone The Actress in her box at the Vienna Opera House. There she has a rendezvous with the ardent Prince/ Guardsman. Tara Franklin (Liesel, the maid), and Michael Gill (The Actor/ The Guardsman), both get their share of laughs in nicely executed minor roles. The fast pace set by director John Rando keeps the laughs coming at us. There is a major and ongoing issue with the sets of BTF. This one by the renowned Alexander Dodge is not among his best efforts. It seems to be recycled from the previous mainstage set for “The Last Five Years.” Once again the box like room is positioned between two flats on either side. This time the wings entail doors. So they were more functional. But an issue with sight lines persists. Seated on the aisle we missed the laughter coming from those in the middle. We never saw the first entrance of the Guardsman. Not only was it staged in a blind corner there was also the obstacle of a wing chair blocking our limited view. The bland apartment of The Last Five Years has been given a paint job and the walls plastered, salon style, with a mongrel hanging of thrift shop paintings. It was intended to evoke a turn of the century cluttered interior. But it was more garish than homey. During the second act the set for the theatre box was more effective. The flanking wings were hung with black velvet. The third act returned to the initial set. 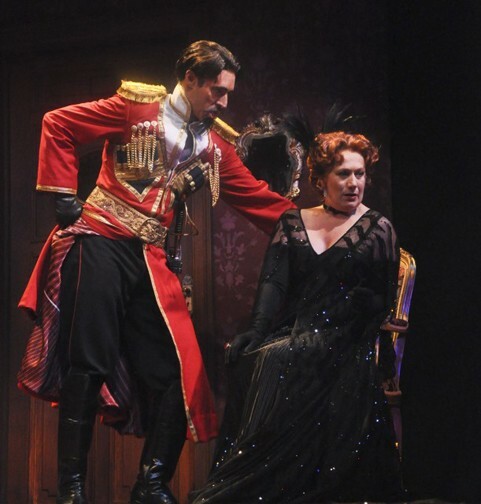 The costumes by David Murin nicely advanced the mood and period. Husband and wife were dressed exquisitely. He wore that absurdly overstated Guardsman’s costume. She had a variety of very theatrical gowns which she swished about with great flourishes. Mama was given a shock of red hair which in the semiotics of the era signifies a woman of questionable virtue. Clearly, Mama knows the ropes of the love game. We hardly emerged from this evening pondering the meaning of life. Unlike Endgame the week before. But the play nicely provided smiles on a summer’s night.